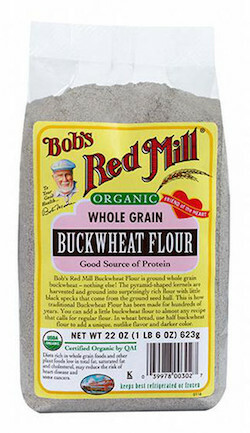 Bob's Red Mill Organic Buckwheat Flour is ground whole grain buckwheat - nothing else! The pyramid-shaped kernels are harvested and ground into surprisingly rich flour with little black specks that come from the ground seed hull. This is how traditional Buckwheat Flour has been made for hundreds of years. Buckwheat flour contains a significant amount of fiber, and studies have shown that it helps slow down the rate of glucose absorption after a meal. Buckwheat is also a good source of protein and calcium. Buckwheat has a unique, assertive flavor that is especially great in both quick and yeast breads. You can add a little buckwheat flour to almost any recipe that calls for regular flour. In wheat bread, use half buckwheat flour to add a rich, earthy, nut like flavor and darker color. Buckwheat flour is a must have for making traditional Russian blini, or buckwheat crepes.